What are you doing at the 2014 WWWBC: I’ve been helping anywhere I can; I’ve sold merchandise to spectators and been allowing only people who have access to the VIP lounge to get in. Whereas at the information desk, it’s pretty self explanatory but I’ll help people to get the information they need. 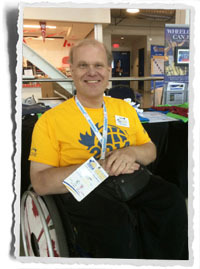 What moves you about wheelchair basketball: What doesn’t move me about wheelchair basketball? Everything! It’s great! There was a little girl who came to me, she’d made a poster and needed some tape to put it up on the wall. I told her, “No, but come see me tomorrow and I’ll have it for you.” The next day she came up to me with a sad face and asked, “Do you have the tape?” I started looking through my bag and I couldn’t find it, but when I finally found it her face lit right up. That was just great.